In the summer of 2016, I was passionately (and I thought strategically) using social media to lay my small brick in the building of a just society by affirming that #BlackLivesMatter and #LoveTrumpsHate, among other things. 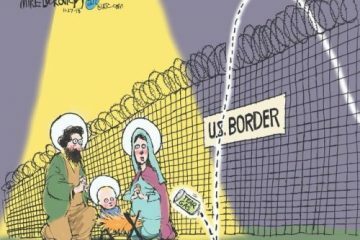 Anxious about where the world (our American corner of it at least) was heading, I felt it necessary to use any platforms available to let it be known that goodness was still here, and refugees should be welcomed, and women should be believed, and brown bodies should be safe. At the same time, I knew there were tones and tactics that could be off-putting; I had witnessed plenty of it. 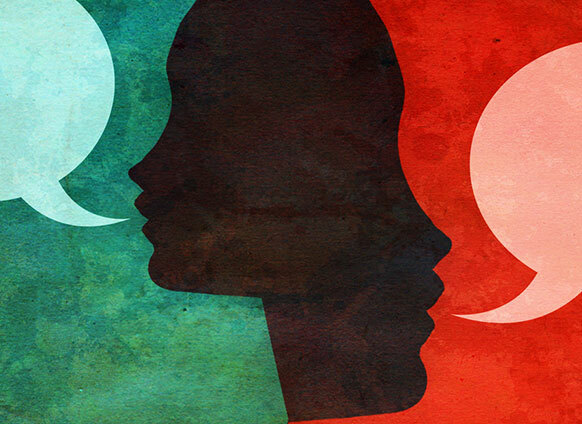 Debates and decided rhetoric that people can’t help but tune out or combat when confronted seemed like the less effective approach to change. So I tried determinedly (though not faultlessly) to be mindful and prayerful about my voice. Brave and merciful. I tried to tell more stories — like subversive parables — in order to get points to resonate. I tried to approach topics through lament, conviction, personal experience, and nuance. Meanwhile, the online world was raging like an angry ocean. A spectrum of contributors was represented, but all anyone could feel and see were the loudest and most angry folks, making everything seem like noise and division. Barricades formed with great distance between us and those “stupid” people — darts flying across the chasms of the internet. We blocked so many, didn’t we? We were blocked by so many. One day, while grieving this newish culture to someone I highly respected, I expressed my utter confusion regarding mutual friends of ours whom I had witnessed tear a disagreeing person to shreds in the broad daylight of a Facebook thread. But instead of getting a nodding head in response, I received her concerned stare as she proceeded to compare us as one in the same without hesitation. I felt nauseated. I’d been lumped into the noise, which at best meant that I was no longer being listened to; at worst, I was being seen as the opposite of Love. I grieved that my posting pictures from our local women’s march (with a homemade “We Go High” poster and a paragraph about how I wanted to raise our son to respect the bodies and minds of all genders) could be seen as comparable to the ugly online fighting I was absorbing from others. And out of fear of being that “clanging gong” that 1 Corinthians talks about, I got silent. Or relatively so. Relatively silent throughout Me Too. Relatively silent after the Parkland Shooting. Relatively silent on the heels of the Muslim Ban. Relatively silent and conflicted. Torn and sad. Convinced that the noise wasn’t working. But also convinced that neither was the quiet. Then I read Kathy Khang’s book, Raise Your Voice: Why We Stay Silent and How to Speak Up, and, in a sobering way, it helped me clear my throat. Khang (whose words are anchored in the soil of her experience as an Asian-American, Christian, female leader) writes about speaking up with voices that are confident in our identities as bearers of God’s image first and foremost — recognizing and reminding us that in a world riddled with injustice, those who follow Jesus have an unsettling calling and responsibility to use (plausibly risk) their platforms for the sake of the oppressed. Esther and Moses being two of many historic and/or biblical examples through whose journeys of raised voices Kathy walks her readers. 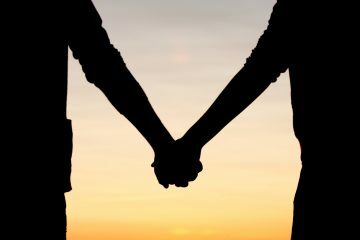 But we are reminded, throughout the chapters, of our interdependency on our diverse neighbors: our need for each other in a world full of systems that grant power to some voices and strip it from others. We are reminded of our callings to be better listeners when we are not directly threatened by things that feel threatening to marginalized people groups (a reality also known as privilege). We are reminded (if not shown for the first time) of a Korean-American immigrant’s experience within the evangelical atmosphere. We are reminded to embrace nuance, mercy, love, and story as we bravely use our platforms and places to challenge the death, destruction, and dehumanization of the world. We are reminded to take care of ourselves, because the harvest can be plentiful while the workers remain few and tired. We are reminded of real, practical, relational ways that we can speak truth to power, connection to division, and hope to despair. We are . . . I am . . . reminded that nothing can be wholly understood dualistically. Including the idea that speaking up is adding to the problem and, therefore, keeping quiet is the answer. There’s more to it; there has to be, for the sake of a world that God so loves. And we want to explore that together with you. 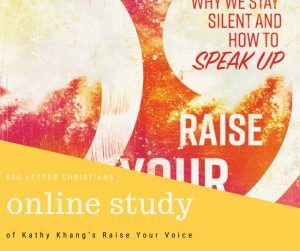 So join us during the month of October for an online book study of Kathy Khang’s Raise Your Voice! Much like our last RLC Online Study, we’ll be discussing a chapter or two a week using the prompts provided in Kathy’s book. At the end of the month, Kathy will offer a Facebook Live event for us to engage with her directly with our questions and feedback. We are humans bearing the image of the Love that created, sustains, and redeems everything. We are wired to be witnesses to the world around us, noticing injustice and speaking up on behalf of other image-bearers’ whose voices are so often dismissed, twisted, or stifled. But sometimes, we forget who we are and what we have to say. Kathy seems to believe that it’s not a time to be forgetting. May we allow her to help us remember. Order your books here (or ask your local library to stock one!). First prompts will be posted on Monday, October 1st. For more info and to join the study, check out the “Raise Your Voice Book Study—RLC” Facebook group.